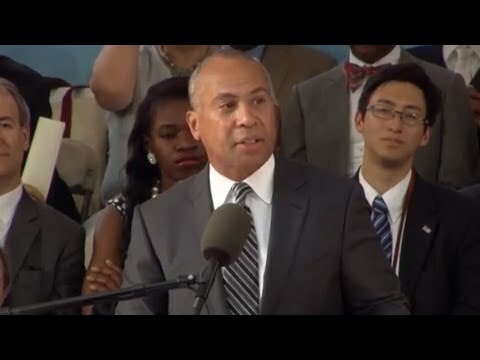 On a day of celebration and achievement, Deval Patrick, the former governor of Massachusetts, told Harvard graduates he hoped they felt uneasy, unsure, and restless: uneasy about the planet’s big problems, unsure they know all they should, and restless enough to act. “I don’t want unrest in the streets. But I do want unrest in our hearts and minds,” Patrick said. “I do want us all to be uneasy about the grim realities of black men and families and the widespread nonchalance about poverty. I want us to be uneasy about the chronic desperation of communities some of us are just one generation away from living in; about the way we dehumanize the fellow souls we call ‘alien’; about the carelessness with which we treat the planet itself. Patrick spoke at the Afternoon Exercises of Harvard’s 364th Commencement on Thursday. During Morning Exercises, the University conferred some 6,500 degrees to graduates of Harvard College and the Schools. The Afternoon Exercises, officially the annual meeting of the Harvard Alumni Association, also featured a speech by President Drew Faust, who cautioned the University’s newest alumni to be wary of the selfie generation of which they are part. The wider culture, abetted by social media, increasingly celebrates the individual and devalues collective institutions, Faust said. Though some say they’re being replaced by online education, universities remain essential institutions, Faust said. Other speakers at Afternoon Exercises included the president of the Harvard Alumni Association, Cynthia Torres, who welcomed the graduates into the University’s alumni community — 320,000 strong, and living in 189 countries. Torres also announced the winners of the medals awarded by HAA for extraordinary service to the University: Charles Egan Jr., Michael Gellert, Thomas Lentz Jr., Sandra Ohrn Moose, and Robert Reischauer. In his speech, Patrick recalled his childhood, growing up on welfare on Chicago’s South Side, as well as his time as a College undergrad in the mid-1970s, in the wake of the struggles over Vietnam and Civil Rights. Students then, he said, seemed hungry for something to protest. Thus came the march over cold breakfasts at Dunster House. Patrick praised today’s students for their activism and for the causes that have won their attention: poverty, racial injustice, climate change. But action on those issues, he said, will require more than just protest. It will require sustained effort, and big ideas rooted in core American values: freedom, equality, opportunity, and fair play. Deval L. Patrick ’78, J.D. ’82, former Massachusetts governor, gave his address at Harvard’s 364th Commencement on May 28, 2015 at Tercentenary Theatre.